The Nabtesco Group performs environmental, safety and health (ESH) activities in accordance with the basic policy and targets shown in the table. The ESH activities pertain to Nabtesco and all its group companies (including its partner companies located on the same premises) and have established the Group ESH Committee under the direct control of the CEO as an organization led by the whole group. 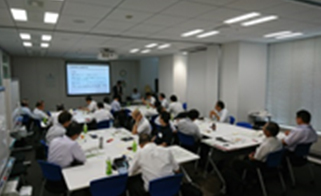 Because the Gifu Plant, Tarui Plant and Tsu Plant place a greater emphasis on processes than other plants, they have received OHSAS 18001 certification and are utilizing the certificate for the establishment and operation of the occupational safety and health management system. In addition, through the annual audit that is carried out by the certification agency, the plants are working to improve their levels of occupational safety and health. We will continue our active safety management through risk assessments, aiming to foster a safety mindset in each workplace, further improve the quality of newcomer education and enhance the risk sensitivity improvement education to promote the development of a workplace with zero disasters. The Nabtesco Group complies with the Industrial Safety and Health Act and other related laws to create a safe working environment. We have established a safety and health management framework in each office, allocated a manager of safety and health as well as a person in charge of safety management to take a variety of measures, such as periodic health examinations and industrial doctors’ visits to the workplace. In addition, we hold the Safety and Health Committee monthly to report on accidents and disasters and perform safety patrols. We are constantly taking measures to prevent accidents and carry out safety awareness improvement activities. In FY2017, the risks of chemical materials were diagnosed at all Nabtesco Corporation plants. The purpose of the diagnosis was to understand the current situation of the chemical materials and devices to be used at the plants and thoroughly remove the risks of chemical materials. We are taking action against items that were pointed out as being insufficiently managed and performing activities to thoroughly remove the risks of chemical materials. No fatal accidents involving employees (incl. temporary staff) have taken place in the Nabtesco Group in the past five years, but one suicide due to overwork happened at the consolidated subsidiary Nabco Door in January 2014. 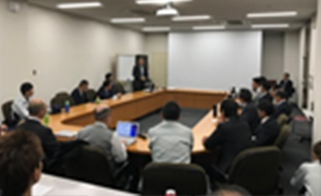 In October 2017, the Higashi-Osaka Labor Standards Inspection Office recognized the incident as an occupational accident (death from overwork), in response to which we retroactively revised our occupational accident incidence (frequency rate) data for March 2014. 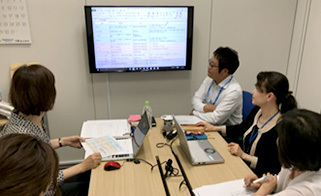 Preventing any recurrence of this error is a major managerial task, so the group as a whole is taking measures to reduce the workload per person by increasing the number of employees and implementing more thorough education for managers. While the occupational accident incidence (frequency rate) is showing a downward trend, we have yet to reach our goal of “zero occupational accidents.” As such, we are working to “create a safety culture” and further increase safety awareness. *The figures showing FY2015 results were produced by setting the period as January–December 2015 and calculating it as twelve months. *When the Higashi-Osaka Labor Standards Inspection Office recognized the incident as an occupational accident (death from overwork) in October 2017, the occupational accident incidence (frequency rate) data for March 2014 (FY2013 in this graph) was retrospectively revised. At the Nabtesco Group, we have been working to create a safety culture since FY2017 and to build a safety culture unique to Nabtesco. 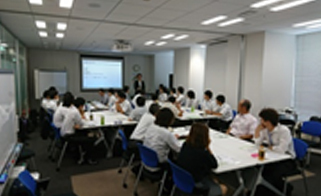 These activities are composed of the four measures of “STOP3 activities,” “a stratified safety education system,” “safety model workplaces,” and “environmental safety fora.” Through these, we aim for “zero occupational accidents” by building an “organization” that can create a safety culture. We convene a Safety Practitioner Liaison Group twice a year, sharing information about safety within the whole business group, reinforcing and expanding safety patrols at each business location, conducting hazard prediction training to increase hazard recognition, making near-miss suggestions, doing public outreach on safety, etc. We conduct safety education using a variety of tools like booklets and videos, but we also sought to expand the educational contents in FY2017 by introducing hazard experience devices. Moreover, we also conducted public outreach activities and put up posters with “STOP3” contents in conjunction with the National Safety Week and the National Industrial Health Week in FY2017. We are also committed to ensuring the safety of our employees in case of accidents or disasters during commutes by holding traffic safety classes, placing safety monitors, posting hazard maps, conducting traffic hazard prediction training, etc. At the Nabtesco Group, we systematically strengthen our factory buildings to withstand potential earthquakes. Moreover, in addition to conducting general disaster drills, we also conduct night drills, earthquake drills, and BCP initial-response drills at some of our plants, and we plan to expand this in the future. In FY2017, we conducted fire risk evaluations at all Nabtesco Corporation factories. The aim was to understand what emergency facilities and fire prevention management are in place at each factory and thoroughly eliminate all fire risks. We are looking into measures to deal with instances where management was deemed insufficient and are rectifying the situation according to order of priority. We will continue to work to thoroughly eliminate all fire risks. The Nabtesco Group conducts risk assessments relating to ESH in each stage from research and development to product design, production, distribution/sales, use of products and disposal. The Group makes it mandatory to assess safety and health risks associated with new businesses, product development, production/manufacturing (new construction/addition of factories/facilities), M&A and other new projects and to report the assessment results before implementation. In FY2017, we conducted ESH risk assessments of nine businesses and projects. For a corporation to achieve a growth, it is essential that it have a physically and mentally healthy workforce that can drive the organization forward. We have two nurses in residence to provide counseling as needed to employees experiencing mental health problems and help them return to work. For employees whose workload is considered high, the nurses monitor their mental health through regular interviews. In order to promote the mental health of employees in a more proactive way, we also host various seminars and lecture events on a regular basis as well as run the Employee Assistance Program (EAP), which is available to employees on overseas assignment and their family members. In line with the revised Industrial Safety and Health Act, in FY2016 we conducted stress checks for the first time. The rate of employees who received the check in FY2017 was 94.5% (increased by 1.1% YoY), which was five points higher than the average stress check recipient rate among companies conducting the test, according to the tabulation by a test outsourcer. The stress check revealed that 12.9% of our employees have a high level of stress, which is 2.9 points higher than average. We will work to improve our workplace environments by making physicians available for consultation and conducting follow-up measures, thereby reducing the rate of employees with a high level of stress to less than 10%. Improving the lifestyles of employees who are suffering or at risk of metabolic syndrome, one of the causes of lifestyle-related diseases, is important not only for safeguarding the health of those employees but also for reducing future medical costs. We oblige employees found by physical examination to have a high risk of brain or heart disease to receive health guidance. We also impose certain restrictions on overtime and holiday work hours of such employees. The Nabtesco Group is committed to raising its employees’ health awareness and improving their actual health status through ensuring workplace environments are conducive to supporting employees with health risks and using labor-management meetings as opportunities for regularly reporting the implementation status of health guidance and working hour restrictions.